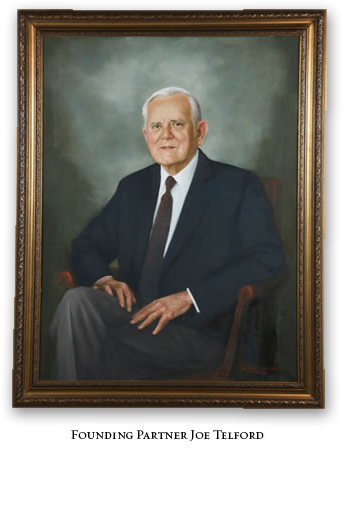 Our firm began in 1936 when founding partner Joe Telford began practicing law in Gainesville under the mentorship of Boyd Sloan. From the early 1940s through the 1960s, attorneys like Jeff Wayne and Sidney O. Smith, Jr. began practicing with Mr. Telford. These men believed in a strong work ethic, integrity, fair dealing, personal sacrifice and a commitment to the community. These qualities remain at the core of Stewart, Melvin & Frost. As the firm continued to grow in the late 1960s, partners Woody Stewart, Doug Stewart and John Melvin came on board. Through them, the well-established tripod of our firm’s capabilities — business & tax law, litigation and real estate — was strengthened. Over the past two decades, we have enjoyed tremendous success growing to more than 20 attorneys and a support staff of 23. It is a success that comes from the hard work of current managing partner Randall Frost, and the dedication of all our partners and staff. At Stewart, Melvin & Frost, our history is truly rich in tradition. It is one of exceeding expectations – for our clients, for each other and for the community we call home.